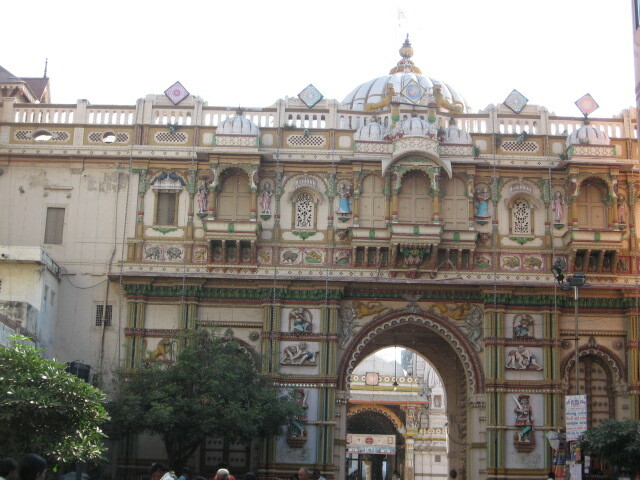 Swaminarayan temple, Kalupur, Ahmedabad. We reached at sharp 8 am. 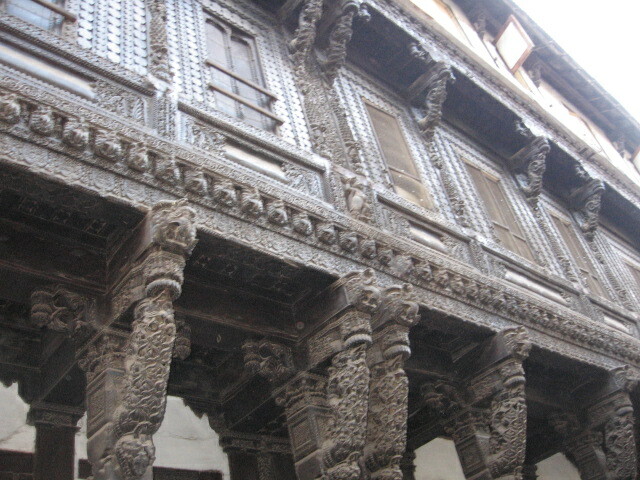 Architecture on the buildings in a pol in Ahmedabad. A heritage walk through Ahmedabad? That sounded interesting. My home town is world-renowned for its walled city, but I had never actually gone and explored those areas on foot. 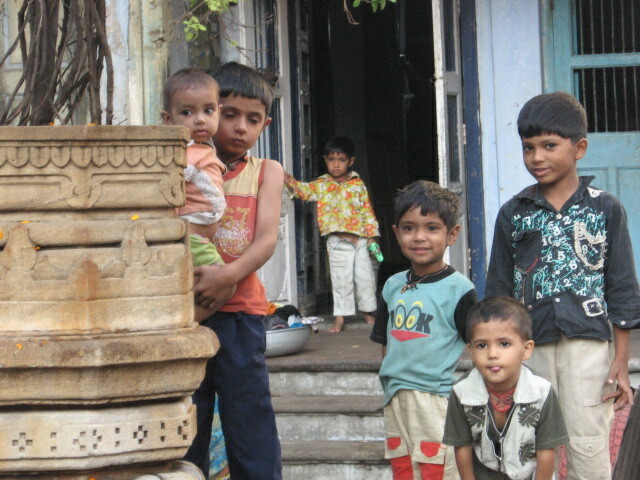 Sometime in 2010, my parents told me about this new program called Ahmedabad Heritage Walk they had stumbled across. Way back in 1997, some people started volunteering to take tourists and uninformed residents (like me) around the old part of the city for a 2 hour walk. In the winter of 2011, we decided to give it a try. The tour starts at the Swaminarayan temple at Kalupur at 8 am. This magnificent temple was built 180 years ago. Just near the entrance, the organizers gave a slide-show presentation on the history of Ahmedabad and the monuments we were going to visit. And then we were off. On the walk, we covered a lot of old Pols, temples (both Hindu and Jain), mosques and buildings with beautiful architecture. The famed Pols are societies consisting of many houses within a common wall. A pol is like a complete town in itself – temples, shops and even secret escape passages known only to residents. The houses are clustered in such a way, so as to both protect the residents and keep the temperature down (which is essential in the hot and dry Ahmedabad weather). There are more than 300 pols in this city. We came across the poet Dalpatram’s home, and a lot of buildings (currently occupied) constructed in Maratha, Islamic, Jain, British and French styles. One of the peculiar features of the Jain temples we visited,was that they were built underground, so as to protect against hostile reigns. The tour ended at the Jama Masjid. Considered as one of the most beautiful mosques in South Asia, the architectural style has both Islamic and Hindu components. The walk delivered much more than what we expected. I would highly recommend it for people planning to visit Ahmedabad or Gujarat. You won’t go disappointed – whether you are looking for history, architecture or just plain life in a city. This Jain temple is completely underground. 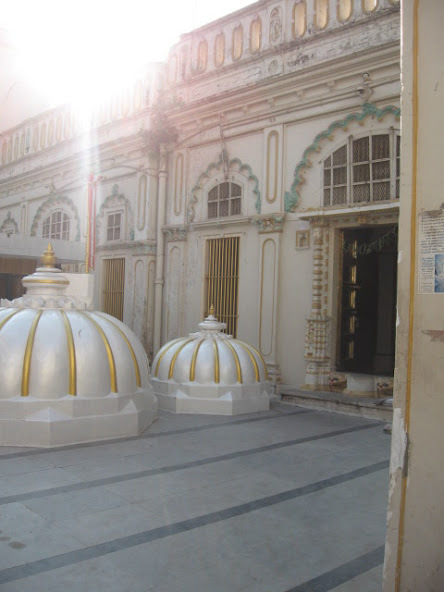 You have any photos of underground Jain temple… ? Hello Naimesh, unfortunately photography isn’t allowed inside the temple. You can click only from outside (just like the one in the post). do you have photos on chaumukhji ni pol ? Hello Akshita, thanks for checking out my post. Sorry, don’t have any pics of the Pol that you mention. You could probably try out some Ahmedabad tourism websites. Made me remeber my tour through Ahmedabad. Great photos and write up!